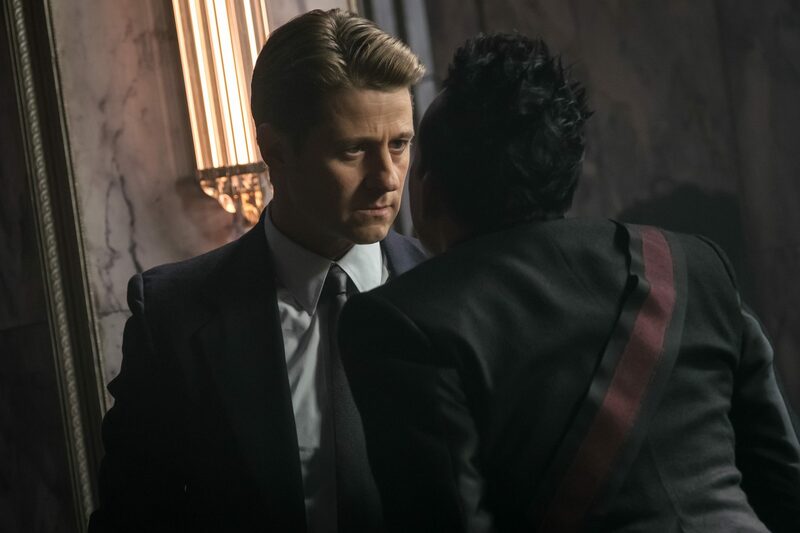 Is it possible that the episodes of Gotham get better with each week? Definitely. 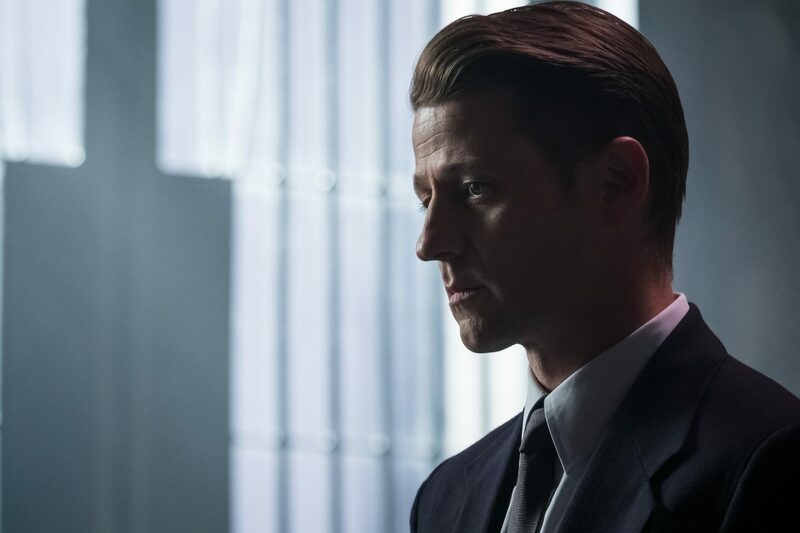 We find out some answers to some unsolved mysteries and see the return of two characters that have become favourites since their first appearance in Gotham. DC fans of the television show Krytpon might be interested to know that the two writers of this episode and new to Gotham’s writers room are James Stoteraux and Chad Fiveash. In the directors chair another Gotham favourite Nathan Hope, remember the episode “Red Hood Gang” from season 1? That’s why Nathan Hope is a regular Director on Gotham. He returns to put his mark and a very remarkable episode, in which I had to watch twice just to believe what I saw. Haven was a success. Captain James Gordon and now whoever is responsible for the explosion has just made themselves a bigger enemy of Jim. There are several suspects, first of all could it of been Oswald “The Penguin” Cobblepot and the gangs he gatecrashed with? Barbara Keane as the explosion did happen as she arrived with Detective Harvey Bullock? 311 souls, 49 injured and two dozen uncounted for including Will Thomas as Harvey found the GCPD badge Jim gave him. I have been so impressed with the direction of Jim Gordon’s character this season he has become a firm favourite. 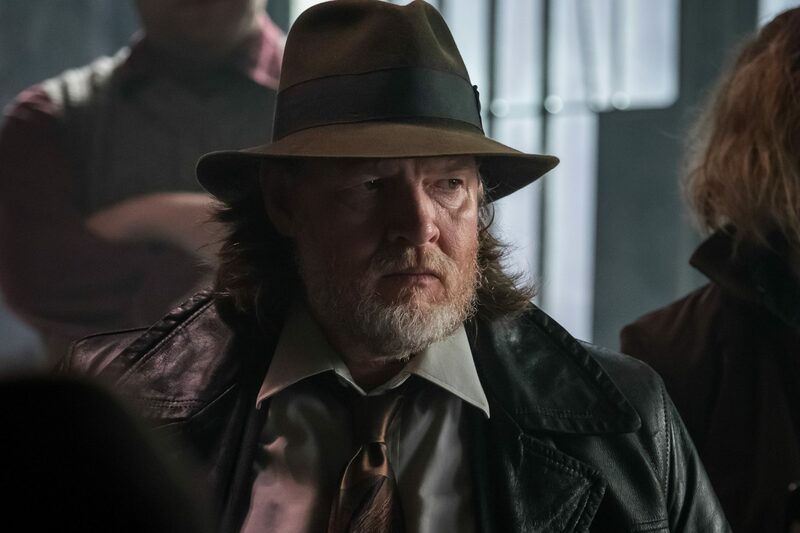 Don’t get me wrong I was already hooked on Gotham when I first saw Gordon and Bullock together, Jim is showing a selfless side which makes a nice step up in maybe some of the decisions he has made in previous seasons. Again as Jim talks through the radio to report the devastation. The woman’s voice that makes him promises of help, rears that frustration that we are seeing more frequently in Jim. Lucius Fox is given the task of finding the Haven bomber. After a speech to the angry crowd of the surviving refugees Jim needs every piece of evidence to find whoever is responsible. Lucius knows it’s going to be a massive task, purely because the size of the crime scene. Lucius is my character of the week and you’ll find out later why. The interesting thing about Barbara Keane in this episode is she had the chance to kill Penguin. After coming around after the explosion Barbara spotted Oswald with his back to her none the wiser. But a moment of realisation of what has just happened at Haven made her realise that revenge at the moment wasn’t important. Bruce Wayne is still handcuffed to the gate where Selina left him in the Church of Jeremiah. Thankfully we see Alfred Pennyworth back this week and as always Master B can’t get his porkies he tells past him. Bruce was able to contact Alfred through his tracker signal. Before they meet in this scene Bruce has to fight of a couple of masked bruts and Alfred took out the rest. Alfred’s honesty and own personal feelings towards Miss Kyle have been quite clear from their first meeting back in season one. But there have been moments Selina has been good for Bruce. Alfred is definitely hoping that one day Bruce will see that he will never be able to save Selina from herself. Until that day comes Alfred agrees with Bruce they need to find her especially as she has gone after Jeremiah. Cinematography has always been at the optimum of excellence on Gotham and this next moment is no different. Harvey is stood face to face with Oswald Cobblepot. Harvey has already radioed through to Jim as he feels Penguin showing up at the GCPD is a bit of problem. Are there strings attached to Oswald’s generosity ? There doesn’t seem to be he just wants the the string to be around the neck of the Haven bomber. Of course Oswald doesn’t let Jim forget that he lost people too. People that Jim lured with promises of safety and security. With wanting to put their considerable differences aside, Penguin wants to see justice done. Oswald puts his hand out to Jim and they shake on becoming partners. Has Oswald just joined the GCPD? The blackout saga continues with Ed waking up to discover an empty suitcase and a smudged note written in green pen on the palm of his hand. What Ed can make out from the note is a number 1215. The word beginning with “I” is missing some letters and after a few attempts Ed decides it spells ‘inmate’. With everything being voice recorded this helps Ed to think what he has to next. He needs to find prison records of inmate 1215 in his next move to find out what is going on. Where are prison records kept? Harvey, Jim, Penguin, his men and a convoy of GCPD officers walk through a back street. They have arrived at Harlow Park. Harvey has a few cross words about Penguin trying to blame Jim for Haven. Jim certainly doesn’t want to hear that he gives people hope as a lot of people are dead. Jim and Harvey organise different squads into different parts of the territory. Oswald who likes to keep things low key takes to a microphone and through the speaker warns “the vile miscreant who murdered those innocent Havenites, you have nowhere to run!” The element of surprise is now useless, and gunshots are fired. Scenes like this really make you want to know who is hiding out of sight. 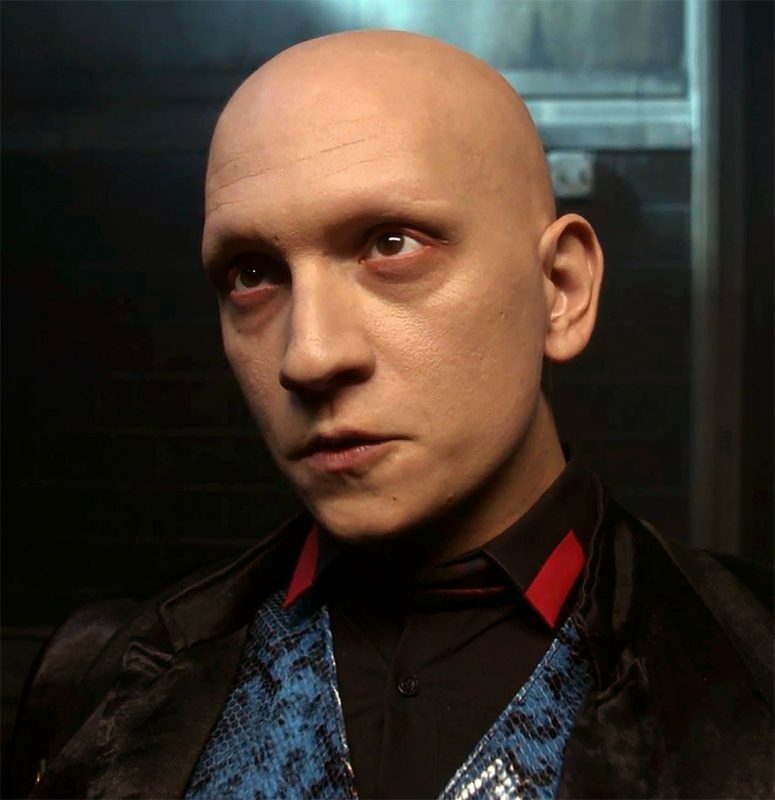 What doesn’t disappoint is the shooter is revealed to be a Gotham’s favourite assassin, Victor Zsasz played by the hugely talented Anthony Carrigan. As Zsasz starts to talk through the open window he is firing through, both Jim and Oswald both recognise the voice. Zsasz pleads not guilty for making Haven go boom. 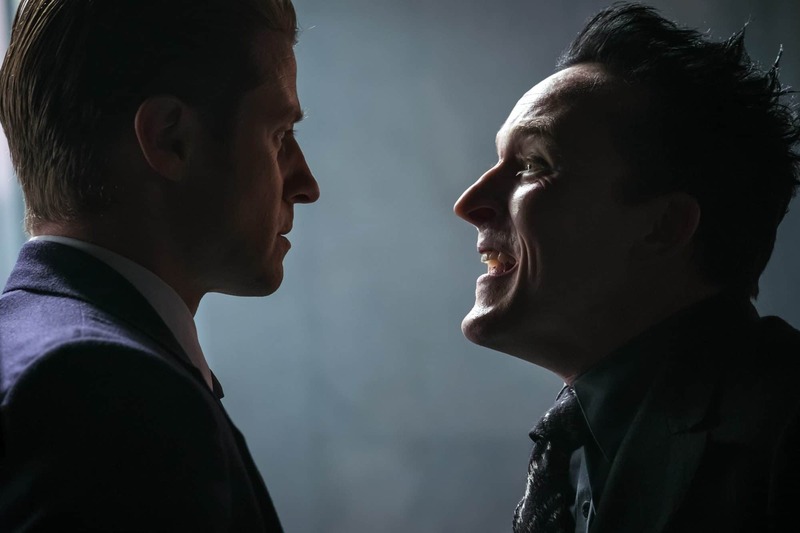 Oswald doesn’t believe Zsasz, their working relationship didn’t end well after Zsasz believed Oswald killed Don Falcone. His loyalty to the Falcone name meant more then the Cobblepot name, and I am sure Zsasz doesn’t know Sophia Falcone was responsible for her father’s death. Zsasz would never take credit for somebody else’s work, that’s his defensive answer for not blowing up Haven. Jim wants Oswald to concentrate as he needs to know how much ammunition to keep Zsasz pinned down for a couple of minutes? As it’s Jim, Oswald and his men have enough for two and half minutes. The eagerness of Penguin to help Jim is infectious as the timer is set to get Jim up to where Zsasz is. Certainly with the element of surprise Jim manages to ambush a relaxed Zsasz and handcuffs him. Some cracks do start to show in the working relationship of Jim and Penguin. Jim knows there is ongoing vendetta between them so Jim is keeping Zsasz in his custody. Ed has used many disguises in the past to get himself inside the GCPD since he stopped working there. Ed steals a blanket from a sleeping refugee to make his way to the records room. Ed finds the file he needs but it is snatched away by Lucius Fox. The pairing up of Mr Fox and Mr Nygma is somewhat genius. The two smartest men in Gotham, or if you agree with Ed, Lucius is second smartest and is really quite gleeful that Lucius needs his expertise. Lucius doesn’t really need to ask as the folder of someone in Black gate prison is valuable to Ed. The interaction between the two characters is cleverly written as Ed gets to riddle, Lucius gets it correct and most importantly for me we see Edward Nygma back in his forensic expert ways. Within minutes of examining what is left of Haven, Ed can tell the structure is still intact so that emliates certain explosives. Another chance for Ed to tell Lucius a classic locked room mystery which gives the answer, the bomb is the building. Debris of glass from the window coming into the basement and remains of an RPG has been found to back up the evidence, of someone firing an RPG at the fuel tank that heats the building. The only angle that it could hit the fuel tank would be from the rooftop. Lucius reports to Jim who has just finished interrogating Zsasz who put forward some fair reasons why he would not blow up Haven. Zsasz is well known in the comics for marking his body with a blade for everyone of his victims. This Zsasz has been shown to do this in his first appearance in season 1. So the point he is clearly making to Jim if he had blown up Haven his body would be covered in sweet scars. Lucius tells Jim he needs a new suspect. It doesn’t take long for Ed and Lucius to find the right rooftop. Ed still in his impressive forensic state can see how the angle of the RPG was fired. Lucius was also impressed but has seen the case that the RPG would of been in. Lucius keeps his promise and gives Ed the Black Gate file as he returns to the lab to see if he can lift some prints. Lucius admits to Ed that he could of not done it without him, but will deny it if Ed ever tells anyone he said. Ed smiles in that familar happy gleeful smile as he opens the file. I made Lucius my character of week for the way he treated Ed as his equal and admitting he could not of done it without him. Chris Chalk and Cory Michael Smiths acting and physical acting have been mesmerising to watch. When Ed finds out the person inside the file is deceased Ed becomes enraged at meeting another dead end. Ed genuinely meant it when he told Lucius he hoped he would find the Haven bomber. After calming down Ed notices an open window with a lady in a wheelchair looking out. Ed leaps around waving and calling out to get her attention as she could of seen who had done it. Because of the wheels of justice are running too slow….for Oswald Cobblepot. He turns up at the GCPD with his men, not to torture Zsasz into a confession but to hold a trial for the people. Oswald ignores the facts that evidence has proven Zsasz innocent. But of course this is Oswald’s own personal revenge on Zsasz for putting him back in Arkham Asylum. City Hall is full of people wanting justice for their lost families. Jim in his reasonable manner can see maybe this is what the people need. Penguin playing the part of Judge and prosecutor immediately puts tape over Zsasz mouth so he remains silent. A witness in the witness box confirms he saw Zsasz walking away from the building. Oswald of course taking his role in people’s court seriously asks the people if they also saw Victor Zsasz walking away from Haven. With a united raise of hands they claim, the people of Haven did. Oswald offers the floor to Jim to say a few words. There is a hesitation from Jim to begin with but he starts with the truth about there being no bomb in the building of Haven. The people boo, but Oswald asks for silence. Jim doesn’t deny that they didn’t see Zsasz walking away but with the rocket propelled grenade fired from the rooftop proves Zsasz is innocent. Jim doesn’t stop there he continues to tell the truth about how help won’t be coming and they are on their own. The people’s court that is being held is not justice it not who the people of Gotham are. 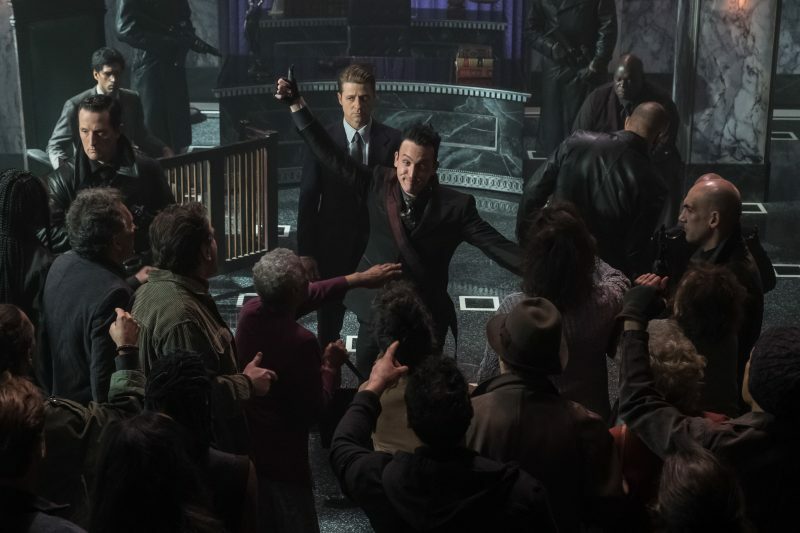 Oswald considers Jim’s closing argument as a defence to Zsasz. The people are the jury and Penguin wants their decision. After a moment of quietness the jury consider Zsasz guilty. 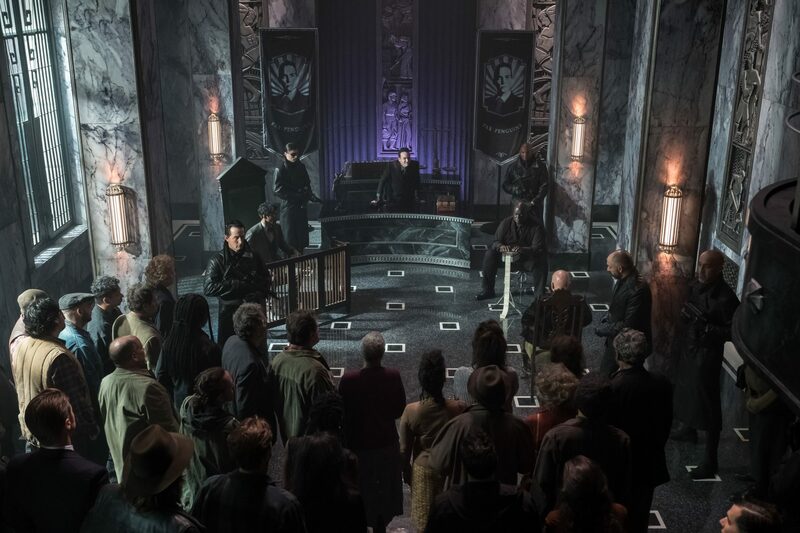 Unfortunate for Zsasz, Oswald has a handy guillotine ready to execute him. Still taped at the mouth and unable to speak, Penguin lets Zsasz have a few last words. Whatever they may be. Jim isn’t prepared to let this execution go ahead and by a very close shave Harvey pulls Zsasz away from the guillotine. I am definitely sure that Oswald is no longer on the side of the GCPD as in his fury and Robin Lord Taylor upgrading Oswald from tantrums to a seething angry monster he demands to know what Jim is doing? Again Jim shows that he isn’t afraid to knock Penguin down when he needs to and in this scene he does it physically. Jim wants Harvey to give Zsasz his gun as he wants a duel. Zsasz asks if Jim has a death wish? He hasn’t he is just feed up of listening to guys like Zsasz. Harvey holds out his gun for Zsasz to take. It’s a small scene towards the end of this episode but it’s so intense as Victor declines as he thinks Jim looks tired. Jim has had the chance to refocus and makes it clear that people like Zsasz are always trying to own this city but they never will. So who was are other returning character this week? 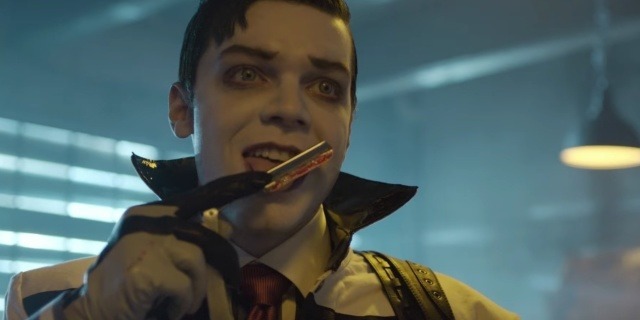 Of course it was Jeremiah Valeska. He is the person one wants the tunnel dug underneath Gotham. Selina has seeked Jeremiah out and she watches as Sykes from The SoothSlayers explains they are still a few days behind schedule. With a cut to the throat Sykes is dead because Jeremiah isn’t impressed by his attitude. In a chilling moment Jeremiah licks the blood of his blade. Ecco interrupts Jeremiah muttering to himself. He seems different to the Jeremiah we saw last season. With a true Mr J and Harley Quinn scene, Jeremiah grabs Ecco by the throat and then start to dance as they discuss the lack of recruits. Ecco’s nickname for Selina is curls and she updates Jeremiah on how Selina and Bruce tried to infiltrate their operation. Jeremiah now knows that Selina can walk and she wants to kill him a lot. In the darkness Jeremiah’s workers are being knocked to the ground. Our hero duo of Bruce and Alfred are responsible. Jeremiah sits flamboyantly fanning himself with his hat. He is trying to give words of encouragement to the workers to keep persistenting in their work. A figure with a white mask and the hooded white, blue and red smock walks towards Jeremiah. I naturally assumed it was Ecco, but it’s Selina. With her first stab into Jeremiah she asks ”is that deep enough.“The look of horror on Jeremiah’s face needs to be seen to believe as Selina continually stabs Jeremiah to the ground. Bruce stops her and Alfred takes out anyone armed. Selina for a moment looks to make sure Jeremiah is dead before she demands Bruce let’s go of her. Is Jeremiah dead? Is this the real Jeremiah that Selina has killed? Stairs have been a bit of problem for a few of our Gotham residents, It’s no different for Nygma. After catching his breath he knocks on a door numbered 1215. 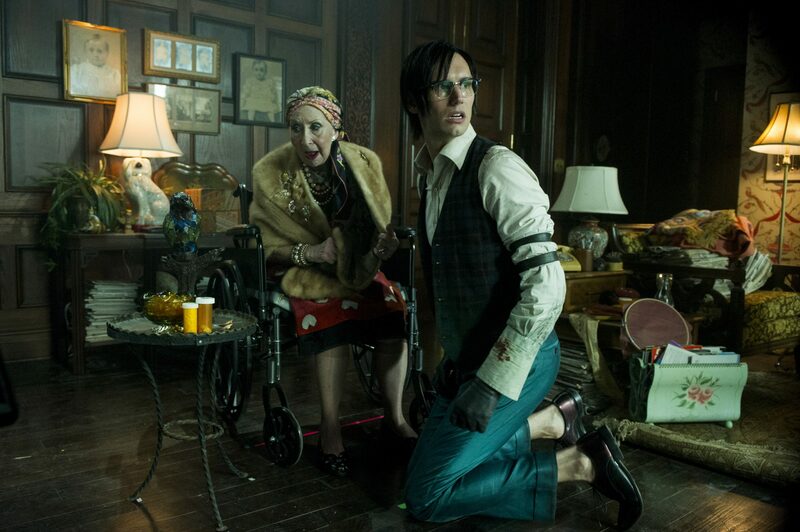 The old lady who answers the door reaction to Ed isn’t good, and this is where I realised Edward Nygma was the Haven bomber and my jaw dropped to the ground. Ed is desperate to know what she knows and manages to make his way into the apartment. Because she is screaming don’t hurt me, Ed crouches down in front of her to calm her so she can tell him exactly what she saw. The old lady saw Ed on the roof with some kind of rocket. Ed is in disbelief as she continues to tell him about how Ed fired it at that building. The old lady takes the opportunity as Ed looks out the window, to wack Ed on the head with a candle stick holder. In a clever psychedelic memory flash back, Ed and sees himself on the rooftop aiming the RPG. Another wack on the head brings the vision of Haven exploding, with another wack brings the memory of Ed seeing the old lady at the window and writing on the palm of his hand. She pleads with Ed that she won’t tell anyone, Ed knows she won’t. In true Gotham style, Ed wheels the old lady in her chair and tips her out of the window. We finally now know our Helicopter and Haven bomber. The next questions to be asked is why does Ed get the blackouts? Why did he target these two things specifically? Is Professor Hugo Strange responsible? Jim is drinking alone in the dark. Barbara comes to visit as she has another tip on a guy who selling RPG’s. Barabra does want the same as Jim to protect her people. Jim’s mood has not lightened with this news and doesn’t improve when Barbara mentions she heard that some of his people have chosen to stay with Penguin. There has been a reignited chemistry between Barbara and Jim this season and it’s believable. But I like Jim with Doctor Leslie Thompkins. Barbara approaches Jim and teases that no one knows what it’s like to be him. Jim tells Barbara to leave, she heard him but moves in for a light touch of his lips. As Barbara walks Jim’s hand touches her shoulder and is this what both of them need a night of no strings attached passion. A brilliant all round episode I would score this 10/10. I cannot wait to see what the episode “Pena Dura” brings to this final season.